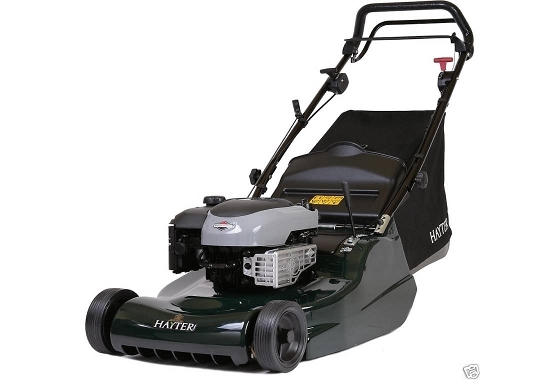 Hayter Harrier 48 19″ Professional Self Propelled Rear Roller Lawn Mower with Fixed Speed AutoDrive and a Briggs & Stratton Engine. The Hayter Harrier 48 Pro lawn mowers are for professional gardeners and landscapers looking to lighten a heavy workload. Robust, vigorous and flexible to enable you to tackle all areas of the garden. The Briggs & Stratton 850 ready start engines are Commercial specification and are fitted with a cast iron cylinder sleeve and a dual air intake system. Front bumper bar to help prevent impact damage. One piece ribbed rear roller for superior traction and a perfectly striped finish. Tough ABS underdeck liner for enhanced cut and collect performance, easy cleaning and reduced noise. The cutting deck extends beyond the wheels for easy mowing around borders. The Hayter Harrier 48 lawn mowers feature a cast aluminium deck which is rust-proof, corrosion resistant and extremely durable. Fixed speed AutoDrive is set for optimize collection.Ergonomic controls for comfort and ease of use. Operator Presence Control for the users safety. Cutterblade friction disc fitted for a lifetime guarantee against crankshaft bending. Fins at the front of the cutter deck give improved cut and collect performance, particularly at low heights. One year warranty for commercial users.